A lot of people, overseas in particular, were calling for a new Zelda game for Nintendo 3DS to come out by the end of 2013. Yeah. 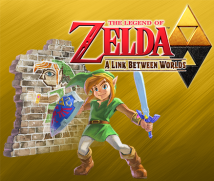 We released The Legend of Zelda: Ocarina of Time 3D14 for Nintendo 3DS, but that was a remake of a Nintendo 64 game. So when I heard people asking if we would come out with a whole new game, I really wanted to satisfy those expectations.14. The Legend of Zelda: Ocarina of Time 3D: An action-adventure game released for the Nintendo 3DS system in June 2011. But Shikata-san and the others were still off elsewhere. Yeah. Then development of Skyward Sword ended two years ago in 2011 and I started thinking about the next project. Since the idea of entering walls had come up, I sensed the possibility of making a new kind of Zelda game from that and thought I should do something about it. I wanted development to make even a little progress, so while they were gone, I resumed work on it. What? You revived the project even without the core members? If I hadn’t, and we’d begun after they got back, we’d never have been able to bring it out by the end of 2013. I brought in a programmer who would carry on Mouri-san’s intentions, and had Tominaga-san join who carried over for Shikata-san. They kept on making the game until the two directors came back. 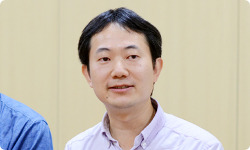 When did Tominaga-san, who succeeded Shikata-san’s intentions step in? It was right after the development of Skyward Sword had ended, so about November 2011. Shikata-san’s team disbanded in October 2010, which leaves about a one-year break. That’s right. Tominaga-san lent support for roughly one year until Shikata-san and the others came back, pecking away at the work of improving the system of entering walls. What did you work on first, Tominaga-san? Without letting myself be constrained by the world of The Legend of Zelda, I made a few small dungeons with entering the wall ideas I came up with, and then about May of 2012, I presented them to Miyamoto-san saying that I would be making 50 more of these dungeons where you used the entering walls ability. But he didn’t just criticise, he also gave us a hint. He suggested basing it on The Legend of Zelda: A Link to the Past. That was when A Link to the Past first came into the picture? 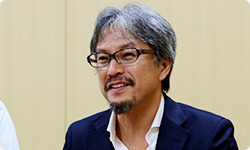 So you based it on A Link to the Past because of suggestions from Miyamoto-san and Aonuma-san? Actually, Miyamoto-san had been challenging me to do something ever since Nintendo 3DS came out. He suggested making a 2D Zelda game like A Link to the Past playable in stereoscopic 3D. But simply taking a 2D game and making it 3D isn’t interesting at all. Right. That was a problem we were facing for a while and I wondered what to do. Then, when I first saw Shikata-san’s gameplay of entering walls, I was surprised, but as we played for a while from an overhead, diagonal angle view like in Spirit Tracks, that surprise faded after a time. Right. It fit perfectly, and I thought, “This is it!” I also suggested to everyone that we should use the landforms from A Link to the Past instead of starting from scratch. Did anyone say that it would turn out like a remake even though you had this new idea of entering walls? They did. Everyone gets sceptical when they simply hear about it in words. So I used a tool myself to render the landforms of A Link to the Past into 3D. Yeah. It took about three days. Did it? (laughs) I wasn’t sure it was right for a producer to go that far, but I thought showing the actual thing would be more convincing and made three-dimensional landforms. I had them place Link and move him around. When they saw that they all marvelled out loud and were convinced that it worked. When we showed it to Miyamoto-san, he finally gave the okay. About when was that? It was two months after Miyamoto-san ripped it apart in May of 2012. The first presentation was no good, the second one was okay, the third was no good, and the fourth was okay, so it went through a cycle of bad to good.